Guides are a wonderful thing. If you’ve ever drawn a guide on your layout so you can lock frames to that guide, you’ll know how nice it is to just click, drag, let go and get perfectly aligned rows of frames. But sometimes you don’t want dozens of guides drawn all over your page. If you haven’t used the Margins and Columns panel under the Layout menu, I suggest you check it out. It’s a fantastic way to create guide lines on your layout without having anything that can be accidentally dragged or moved. The margin guides can be hidden, are visible in InCopy, and make it a great way to show that you’ve got your art and text in the live area of your file. Whether you are creating a book where you need to make sure that there is the correct amount of white space in the gutter to keep things from getting cut off in the binding, or whether you’re creating a postcard and want to make sure you don’t have text too close to the trim so you don’t risk losing something that is very important in the final image. And if you’re often dragging around frames, if you keep your Snap to Guides selected, your boxes will lock to the margin guides and you’ll have less work to perform to get items to align. And that’s great. Having a guide on the page to always let you know if you’re within your safe printing or binding area is wonderful. But there is more that you can do with unselectable guides. In that same window there are column guides you can set, too. Imagine a newspaper front page. There are likely very even columns of text with white space between them and occasionally image boxes that align on those columns. But what if your layout calls for you to have one really wide column and one skinny column? Well, if you choose 3 columns and adjust the gutter (which is the white space between columns) then you just can create one text area that runs across two columns and one text frame that runs across one. In this example the light blue box is your main text column and the light pink box is your secondary text column. The Document Setup window also has settings that will apply permanent guides. If you’ve got documents that need to have a set bleed per your printer’s requests, you can set that as well in the Document Setup window. Click on More Options and you can enter in the amount of your bleed and a colored guide line will appear outside your document edge. If you enter a slug area in that same window you’ll get another colored line appearing outside your document edge. The slug area is a great place to put information that you may want to be able to include in a printout or a PDF, but that you would also want to exclude from a printout or PDF. (When you print, you can choose to have your bleeds or your slug area included in the printout or PDF. The nice thing about all these guide lines is that you can determine what color they appear in your document. And you can align those colors with the colors of your layers. Say your slug guide lines are light blue. 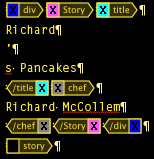 You can create a layer called slug, make sure it is colored light blue, and then you can add whatever info to a text frame that you might find helpful. This makes the slug guidelines and your text frame the same color so they’re easy to visually relate to each other. You can have different margins on each spread, or even each page. If you know you’re going to have just a few different types of shell files with guides, swatches, layers, even styles then you can create a file that has all the info in it you want all of your documents to have, save it as a template (it will have .indt in the name). Then when you want to create a new file choose File/New/Document from Template. Open your desired file and you’re ready to go and you’ll know that all of your preferences are set. In fact, if you choose that option now you’ll be taken to Bridge where you can see all the different templates that InDesign comes loaded with. Might be worth poking around to see if there is anything that will help you out.